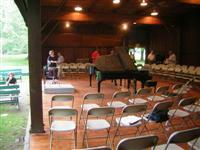 Just posted a new set of photos from the Tanglewood grounds from the last few days of rehearsal for Gurrelieder. Hopefully it will stop raining soon and tomorrow’s will be a bit brighter. Many of these photos were taken in the formal gardens on the Tanglewood grounds, which are well hidden near the theatre building and seem a bit forgotten (though the hedges are cleanly clipped, they’ve grown to the point of beginning to obscure some pathways). Incidentally, the photo to the right may help provide some context for why Maestro Levine had difficulty being heard over the rain. Imagine him sitting just inside the building near the open side, with a 120-voice men’s chorus facing him; then imagine a torrential downpour on the outside. Next Next post: Friday Random 10: Is it Saturday yet?